WhereToFindCare.com Blog: Do you know YOUR test results? Do you know YOUR test results? Do you the results of your last lab, mammogram or radiology test? The industry standard is to accept that the findings are normal unless you “hear from us”. According to a report published in last month's Archives of Internal Medicine, physicians fail to share abnormal test results with patients in one of every 14 medical tests. Are you that one? All test results should be directed to the physician responsible for that patient. The physician should personally sign off on all results for his own patients. The practice should inform patients of all tests results, whether regular or irregular. Practices should have a clear and simple documentation procedure for recording which patients have been informed of their results and which haven't. Ask the physician during your visit how long should you wait before you contact their office to inquire about test results. Ask your physician who you should contact that will pull your chart and review your test results. Ask the lab or radiology provider if a patient copy can be sent to you. Most hospitals will furnish you a copy if you inquire at the Medical Records Department and inform them it is for your followup care. In my experience, radiology providers are more willing to send you a copy than a laboratory provider. Schedule your next appointment if a rule-out test is ordered. This will get you on the schedule quicker. 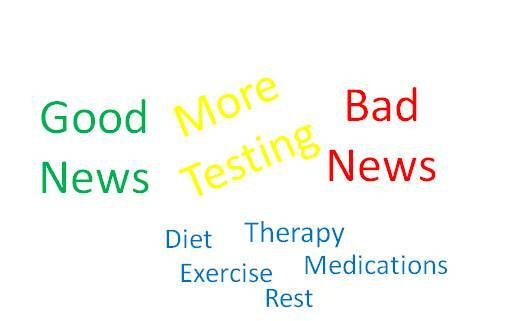 Regardless of your test results, negative or positive, you will need to talk with your provider and ask them what your next step is; another test, a referral to a specialist, changes to your diet, RX, rest etc. Looking to help organize your visit to the physician? Check out the Patient Answer Form, use it at your next visit, and let us know what you think. Yes, I have to physically pick them up from my primary care physician and take to my neurologist.